← God Bless Our 2nd Amendment!!! 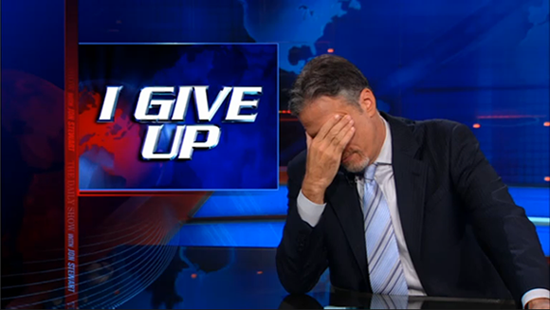 When watching The Daily Show makes you feel closer to God than going to Church, you might be getting ready to give up. About three years ago, I decided I wasn’t going to go to Church anymore. Like many of you, I grew up going to church…. But like many of you, there came a time when it just didn’t work for me anymore. There were parts I still loved–the music, the fellowship, the friends–but I was just so sick of being disappointed every week. 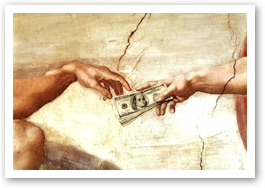 Things were getting more and more political (in the worst way), and it began to sound like folks believed that God rewarded “the faithful” by making them rich. There was a disturbing sense of certainty that is not uncommon in conservative Churches…. but it was more than just conservative vs. liberal, or any of those clumsy labels. Really, at the heart of it was a difference in our understanding of who God is, and it became harder and harder to reconcile a picture of a God that seemed so starkly different than “the Image of God” I understood Jesus to be. I was okay feeling like a missionary to conservative Christians at first, but after a while it just made me feel exhausted. And I gave up…. Not on God, but I sure gave up on Church. Just about everyone has been hurt by a church at one point or another–Many of us more than once. Maybe it wasn’t the actual Church leadership that hurt you. Maybe it was just a person who was trying to rationalize their hatred with some random Bible verse. Maybe it was a denomination that views change and reform as something to be feared and demonized, instead of something that has been part of our history all along. Maybe it was a tradition that reads the Bible like an accounting ledger instead of a book of poetry. Maybe you were like me, and you stayed in a faith community long past the point you knew it wasn’t where you belonged (but you lingered because of relationships or inertia or whatever), and it took something awful (like an Easter service where no mention of the resurrection is made, but 45 minutes is spent talking about stories of financial success that came about by faithful tithing) that leaves your eyes filled with tears and your mouth filled with promises never to return. We’ve all been hurt…. But that’s to be expected, because the Church isn’t a building–It’s people. And where there are people, people are going to end up getting hurt. It’s what we do. Everyone knows the prophet Amos was a die-hard republican…. TALK TO PEOPLE–This may seem simple, but talk to people about your frustrations with Church. Don’t be ashamed, you are not alone. If the person you’re talking to tries to correct your errant ideas with “the clear teachings of scripture,” keep looking. If the person you’re talking to actually listens to you, it’s a step in the right direction. If you find that the person you are talking to had a lot of the same frustrations as you, and he or she found their Church to be a really welcoming place, there’s a chance you might find it to be a safe place as well. 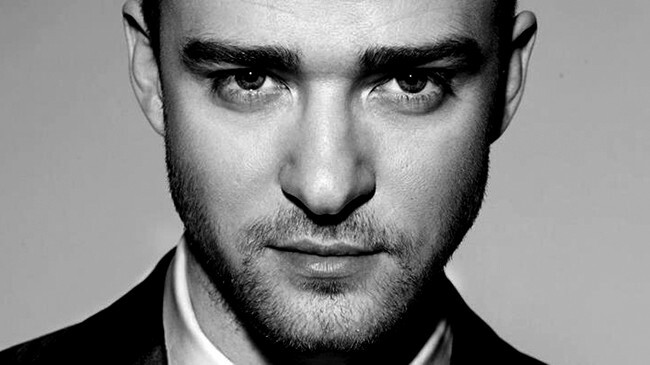 Nothing will get my wife into a Church like Justin Timberlake. Sorry, I just threw up in my mouth a little bit…. VISIT THE CHURCH–Duh, right? But you’ve got to go. Sometimes, you can tell right away that it’s not a good fit. Like if you drive up and see an American flag the size of a tennis court flying next to the Church, you should probably just skip and go straight to Chipotle for lunch (the lines get long on Sundays). Look for bumper stickers…. Do the ones that you see generally piss you off? That’s not a good sign. For me, there are some things that I just can’t deal with…. Like, if you even get a hint–A HINT!–that they are selling the story that God is going to somehow make you rich because of the money that you give to the church, RUN, do not walk, toward the exits, hustle to your car, let your car door swing open so wildly that it accidentally puts a ding in the Escalade parked next to you, and try another church next week. Treating the tithe like a hot stock tip is just a deal breaker. MEET PEOPLE–Shake some hands, make eye contact…. Did people say hello? Were people friendly without being creepy? Was everyone wearing the same color Converse high tops? Did things feel inclusive or exclusive? Did conversations feel comfortable or pushy? Were the people in charge of taking care of your kids competent and kind? Did your kids enjoy their class? This one may take a few visits to get a handle on and navigate, but basically–Did you feel welcome and were people nice, or did you feel like an outsider? LISTEN TO THE MUSIC–For many (myself included), music is a very important part of the service. Listen to what is being sung…. Does it sound true to you? Some people are like, “I could never go to a Church with drums and a guitar.” Others roll their eyes at the sight of an organ or choir robes. Here is my advice: Do not make a rash decision about the church based on how “contemporary” the worship is. Give it time…. Some Churches with old, conservative-sounding worship are as liberal as they come with their theology. And vice versa. Just listen and give it a chance. It is the heart of worship that matters. 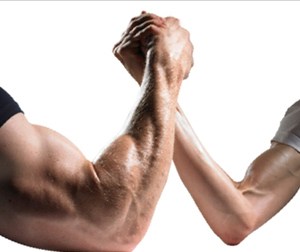 Arm wrestling with God…. It’s hard. LISTEN TO THE SERMON–Did it speak to you? Did the pastor portray God as someone Jesus saves us FROM, or reconciles us TO? Do they tackle the hard questions? And probably more importantly: Do they do it with a sense of humility? When they get to the parts that are hard to make sense of (and believe me, there are a lot of them), do they acknowledge and even welcome that tension? Or do they handle that tension with a big fat “Because God says so when He wrote it in the Bible.” There are plenty of “God said it, I believe it, that settles it” sort-of-churches out there, but many of us are finding that model just doesn’t work anymore. The name “Israel” means “to wrestle with God.” We come from a very long tradition of things not being perfectly clear. TALK TO PEOPLE IN LEADERSHIP–Talk to the pastor…. Is he or she accessible? Ask about other Churches in town…. Are they honoring of other faith traditions? Ask the pastor what he or she thinks of an author or a prominent church voice that you are familiar with or even agree with…. Do they even know who that person is? Sometimes ignorance can be just as telling as a difference of opinion. And if you’re really feeling brave, ask them how they feel about the LGBT community. I know that for most people, this one issue is not the most important consideration when finding a Church (unless you happen to be gay and looking for a Church, in which case it is VERY important), but it IS a sort of litmus test. If a Church is accepting and affirming gay folks, chances are pretty good that it is going to be the sort of community that welcomes questions. And even doubts…. Two things you might have plenty of if you are anything like me. So if you are one of those people–people like me–who gave up on Church, but didn’t give up on God, I want to encourage you: You don’t HAVE to give up on Church! There are places for you out there, they’re just a little bit harder to find. We need Church. This journey toward God, this recognition of God’s journey toward us, this letting go of the lies we’ve believed, this learning to love and forgive–We were not meant to do this alone. The one thing that God looked at in the creation story and said, “This isn’t good” about is the man trying to do it on his own. We were meant for community. And as much as we need that Church community, the world need us to be a different picture of the love of God–A God that says, “Do not be afraid! I’ve got some good news of great joy that will be for ALL PEOPLE.” The voices telling of an exclusionary God are loud enough…. The world needs to hear our voices as well, proclaiming a gospel of inclusion that actually sounds like good news. And we’re way louder when we proclaim it together. ***As a Post Script, if you are in the Nashville/Franklin area and you’re looking for a really cool Church community, GracePointe Church is fantastic. In addition, if you are a reader from other areas, and this description sounds like your Church, feel free to leave the name & area of that Church, just in case other people in your area are looking for a safe place to land. This entry was posted in 1) Jesus and tagged Giving up on Church, How to find a Church, Jesus, Progressive Churches, Tips for finding a Church. Bookmark the permalink. If you are ever in Philadelphia, come visit Circle of Hope (Broad and Washington) – I have actually shared this blog with our entire network and a bunch of my friends started following your blog and love your writing. Peace and Love from a city without. Thanks so much, Kirby. Peace and Love right back atcha…. Is there Whisky & Hymns? If ever in Fayetteville, Arkansas-check out St. Paul’s Episcopal Church. They not only talk the talk of being an ALL inclusive church, they walk the walk. Uh, this post was spot on. Thank you for putting into words what I’ve felt for years but didn’t have the courage to share in my conservative world. I HAVE found that church – Kansas City area – UMC Church of the Resurrection. Progressive, inclusive, and HOME for this one. So glad you found a place. We are in Florence Alabama. Everyone is welcomed! I checked out the website…. I looks like they are doing a some amazing things there. Thanks Francie. Nice advice, and I appreciate that you were open, and dare I say it, brave enough to say this all out loud (so to speak). Thank you for sharing this message. And if you’re really fed up with churches, try a Unitarian Universalist congregation. As an agnostic, I find the lack of any specific creed refreshing. I’ll probably become a fixture in the Christian small group, too, although I haven’t been to it yet. And they seem to be reliably on the political left, which might be a plus for many readers here. Thanks mihipte. I’ve never really come close to being fed up with Jesus…. It’s just the Church that about did me in. I hope you find a place you can grow. Oh, I forgot: My point was that there are Christians (by some definition) at Unitarian Universalist congregations. So I was offering a more extreme alternative along the lines of your post. to comment on the topic, I think sometimes when people have a bad experience with a church, they become prejudice against all churches. Not all churches are bad, a lot of them are good. You just have to be willing to try them out. Just remember they are made of humans who make mistakes. If in St. Louis check out New Voice Church (http://newvoicechurch.com). God is doing some great things through us. How do I (may I) post this to Facebook? Belle Meade UMC in Nashville is the perfect example of a church with a very traditional worship service that is progressive in it’s acceptance of ALL others. The name “Belle Meade” fools a lot of people. Loved this. If you’re ever in the Athens, GA area, there’s a church for you – Athens Church. We strive to lead people into a growing relationship with Jesus Christ and to create a church that people who don’t like church love to attend. I feel like you wrote this directly to me, Boeskool, as I’ve been floundering in San Diego for the past year. I’ve tried several churches, walked out on one sermon, and drove away from another, crying and spewing my “best” vulgarities. Thank you for this very timely post. Feeling inspired! This kind of comment makes me so freaking happy. In Akron-Canton OH. A hidden gem that this article describes perfectly is Harmony Springs Christian Church in Green! I’m going to share this on my Walk The Earth page on Facebook with the line: I wish I had written this myself. I could have. Harmony Springs Christian Church in Green, Ohio. That is where my wife and I have landed after 17 months of looking at more than a dozen churches. Best of luck to everyone reading this. The search for a religious community that will bring out the best in us, not the worst, is so important. I’m a Unitarian Universalist minister, and most of the folks in my congregation, whether they grew up UU or unchurched or (like me) in another faith, are looking for something like what you describe. It’s an honor and a challenge to live up to it. My sermon this week is a response to a child’s question, “Why do we have church?” and I could quote this whole piece as a list of yeses and noes . . .
Keep up the good work, Reverend! It’s fantastic…. All the way through. Thank you for sharing this wonderful post. It really spoke to me, as I’ve felt this way for years. I grew up in a Southern Baptist church, but started question their ideals as a teenager. I left the Church entirely about 10 years ago, after an extremely hateful sermon about “stoning” gays. Now that I have two young children, I sometimes yearn to go back to something, so that my kiddoes can experience the good side of Christianity (because I know it’s not all bad). Any suggestions for Austin, Tx would be appreciated! I still attend my parents’ church when I visit them, and last week my mom gave a mini-sermon about (evangelical) hell right before she sang a special about it that she wrote. 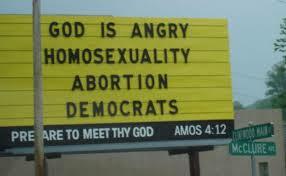 Fortunately, I don’t think I can honestly call anything I’ve encountered at church “hateful” (I guess we aren’t so much into stoning in North Texas). But I can definitely relate. What’s a person quickly losing their grip on faith do you do when all of the pastors in their area have told them ‘there’s probably a better fit for you somewhere else’, but there is nowhere else in the area? Meet with people you respect at a coffee shop. If you’re short on contacts you respect, meet with people you don’t know through local meetups (relevant to some area of interest for you, like art, food, or programming) posted online. They might have the same problem, although I recommend being careful to not destroy other people’s beliefs. I’m only totally honest when I’m reasonably confident I won’t do any damage. …or…although I realize this can shake the psychological foundations upon which many seem to rely for coping with the reality of each human’s lifelong-struggle to survive…You might just step back and try to objectively consider if such difficulty in finding like-minded “believers” and such need to “be careful not to destroy others’ beliefs” are evidences that what you and all others “believe” are simply varieties of human-originated wishful-thinkings? Oh, and I found online Christian apologetics forums very useful, because that’s the culture I came from. They showed me how I disagreed with my former beliefs. Sounds like you experienced the same thing many people experience when they reach a certain age. The pictures in the article illustrate what a lot of people have a hard time with about churches these days. It’s true that talking to people can help a lot. It helps you create social ties as well as get a feel for what type of people go to that church. Paying attention to the teachings is also important. Thanks for the article, I really appreciate your words! How about a non-traditional church that doesn’t have a one-man sermon? Instead ordinary people show and tell what God has done as they are prompted by the Holy Spirit. It is a powerful experience every Sunday at 10:45, 225 Berry St., Nashville 37207 — The Salvation Army Berry Street. My family and I have just moved to a new state, and we are hoping to get a new start here. One thing I am considering about doing is finding a new church, but don’t know what to look for in one that would be a good fit for our family. I like how you pointed out that one way to do so is to talk to the people that go to different churches, and its good to know that if the people actually listen to us and understand where we are coming from might be the congregation we might want to join. Thanks for all the different insight!